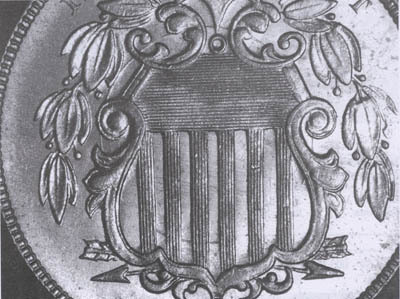 In the years 1866 through 1869, the master hub for the shield nickel obverse was missing a leaf on the right side of the second right leaf cluster. These leaves were engraved by hand instead. Occasionally, a die was made where they forgot to engrave the extra leaf. All missing leaf varieties look pretty much the same, so the Top 20 doesn't call out a specific one. But it is an important enough variety to include in the Top 20 even in a generic sort of way. The above missing leaf coin happens to be from 1867. Here, for contrast, we show an 1868 that has had the leaf properly engraved. Because the leaves were hand engraved, a wide variance in shapes and sizes is seen. 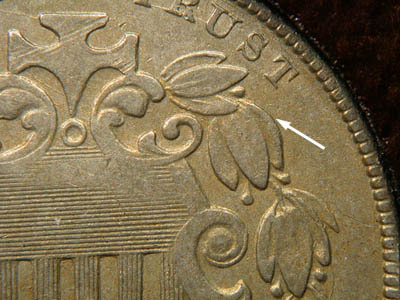 Matching up the shape of the engraved leaf can be most helpful in attributing early date shield nickels. Note: For purposes of being listed in the Top 20 Registry, any missing leaf from any year is acceptable. Runner up is a very special Missing Leaf coin. 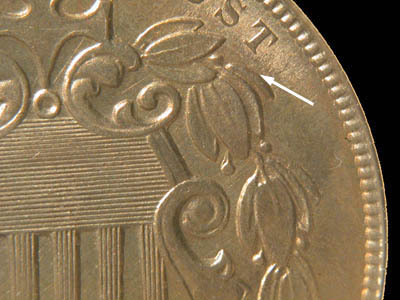 In addition to the Missing Leaf this coin shows a large circular scribe mark on the left side of the coin.